Well, I am in New York City for two days, my very infrequent taste of everything overload. This jaunt happens less frequently as I age, compared to a week or more every year from 1979-2005. I thought, as I was on a exploratory walk around midtown that I would try something different this year. Instead of the typical New Yorker “walk of indifference” (not making eye contact with anyone), I did just the opposite; I looked at everyone, trying to get a snapshot at his or her inner complexity. This, of course, was enlightening. I began to realize that as interesting, complex, rewarding and challenging my life may be at times, there are millions of others who live in their own similar world. What are their lives like? What type of work do they do? How large are their families and what is the history behind their clans? What foods do they eat? Do they stick to their ethnic upbringing and focus on the foods of their ancestors, or are they Americanized? Do they cook and are they good at it? I walked down Eighth Avenue to 52nd and then left on 7th to Central Park South. There in all it’s glory is the home to Per Se and Masa (I won’t be dining at either), Columbus Circle and, the Park. Picking up my pace I headed up Central Park South passing The Nikko, the Old Plaza Hotel (no longer serving in that capacity), crossed in front of the most photographed fountain in all of New York and stared across the street at a crowd of at least 600 or so people waiting to get into the Apple Flagship Store (nearly a week after the release of iPhone 6, people are still viewing this as a must stop in New York). Turing up Fifth Avenue I thought that it would be great to have a walk past some of my old stopping points. First to the site of the original Aquavit – nope they moved from this spectacular piece of real estate. On to 52nd for a walk down to Avenue of the America’s – nope it was fenced off, keeping protestors away from the dignitaries attending conferences on global climate change. Looking at people now, I saw many familiar faces: a few political analysts from CNN, some models I have seen in commercials (don’t know their names), a guy who was a dead ringer for Carlos Santana (maybe it was him) and then a convoy of seven Secret Service Escalades with police escorts (could it be the president?). Taking a detour back to Fifth, I thought – well I’ll move on to 48th street and walk through Sam Ash and Manny’s and drool over their guitars and percussion instruments – nope, both are gone, leaving the block pretty desolate (apparently Sam Ash moved to a superstore on 34th – I can’t imagine it will feel the same). A bit hungry, I thought I would stop in somewhere for a small bite, not enough to spoil my dinner with some chef friends later on. Of course, the problem in New York is too many choices. It seems like every other storefront is some type of restaurant. Pick a cuisine: Thai, Korean, Indian, Scandinavian, Russian, Japanese, etc. There was a new street vendor selling Gyros. He had a fleet of three trucks parked on 50th and 6th. There were at least 80 people waiting in line. Although I support the food truck movement I kept thinking that this is a Health Department nightmare and that line of people is oblivious to the potential for stomach cramps this evening. Thomas Keller has a Bouchon Bakery across from Rockefeller Center. I wonder what his rent is? I really wanted a few pieces of sushi, but I always shy away from restaurants with pictures of food that are turning yellow and windows that haven’t been cleaned this year. 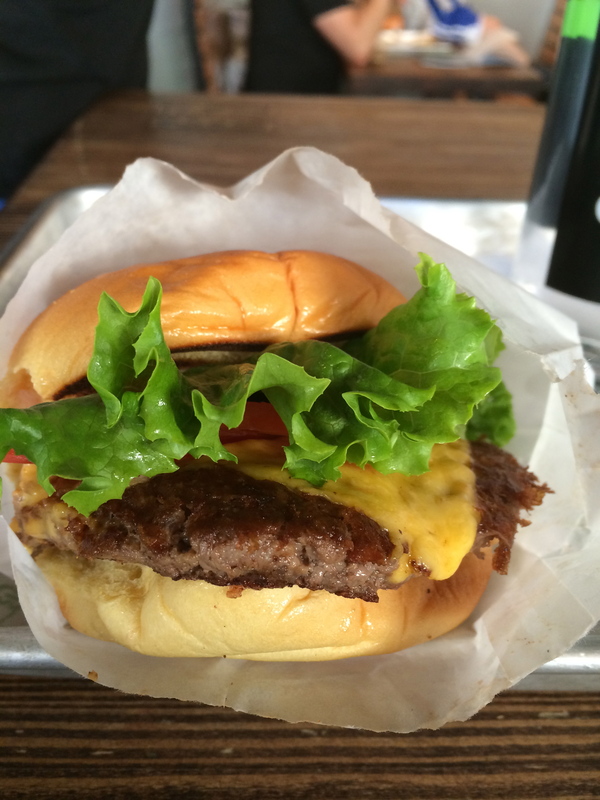 So, I settled on Shake Shack for a Shack Burger and bottle of water. This 8th avenue store is one that I have visited before. At 3:30 in the afternoon it was packed and I actually broke one of my overriding rules: I actually waited in line. It was only about 20 minutes, so I entertained myself by taking pictures of the crowd and wondering if they really thought the food would be earth shattering. There must have been 125 people in the restaurant and the closest count I managed was 30 employees (8 line cooks). Across the street is a McDonald’s – empty. Across midtown there were cooks and chefs leaning up against massive buildings, on break, taking a smoke; vendors lined up on every street delivering the raw materials that restaurants needed to function tonight, and shift changes for both front and back of the house. Diners in New York don’t even think about making a reservation before 7:30 or 8. 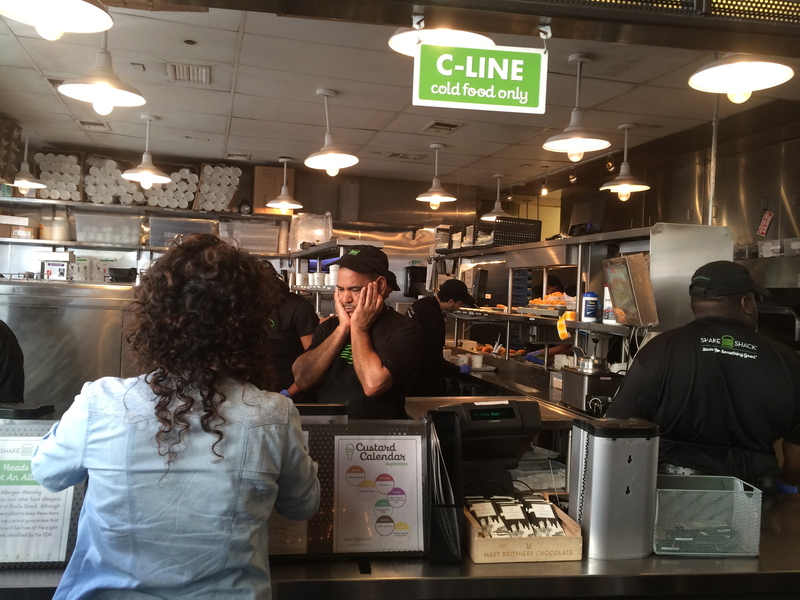 Restaurant staff will still be filling orders after midnight, even on a Monday night. Ah..the city that never sleeps. Finally, I got my anxiously anticipated burger and water for $8.00 and found a corner of a high top to wolf down the mid-day treat. It was good. I found myself thinking, how hard can it really be and why is it so hard for others to follow the formula. Hand form the burger, make sure there is a good ratio of meat and fat, grill it hot so that the meat caramelizes and adds flavor, toast the bun, make sure the tomato and lettuce is fresh and crisp and act like you are happy that customers are spending their money. I wonder if any McDonald’s executives have visited Shake Shack. Now I am back in my absurdly priced hotel on 8th and 52nd trying to piece together what I learned over the past two hours. People are the ultimate spectacle. It is great fun trying to figure them out. What ever you think your problems are, there are thousands who have more significant issues to confront. If we take a moment to look people in the eye we start the process of understanding our similarities and accepting our differences. Visit New York, walk for a few hours, look people in the eye and try to understand. You might even go out on a limb and say hello to a stranger. Tonight I am off to one of those spectacular restaurants: SD26 by Tony May – a New York icon. I will be toasting and breaking bread with some great chef friends and celebrating our similarities and our differences. Tomorrow it is work but I hope to finish the evening at Eataly, watching people once again. ← HELP TO SUPPORT THE RELEASE OF “THE EVENT THAT CHANGED EVERYTHING”.